Day beds, chaise lounges, cabanas. Liquid Pool Lounge at the ARIA is one of the hottest new spots in Las Vegas. Tucked behind three of the other resort's pristine pool areas is Liquid – in a secluded world all to itself. The poolside music sets the stage for a one-of-a-kind experience. 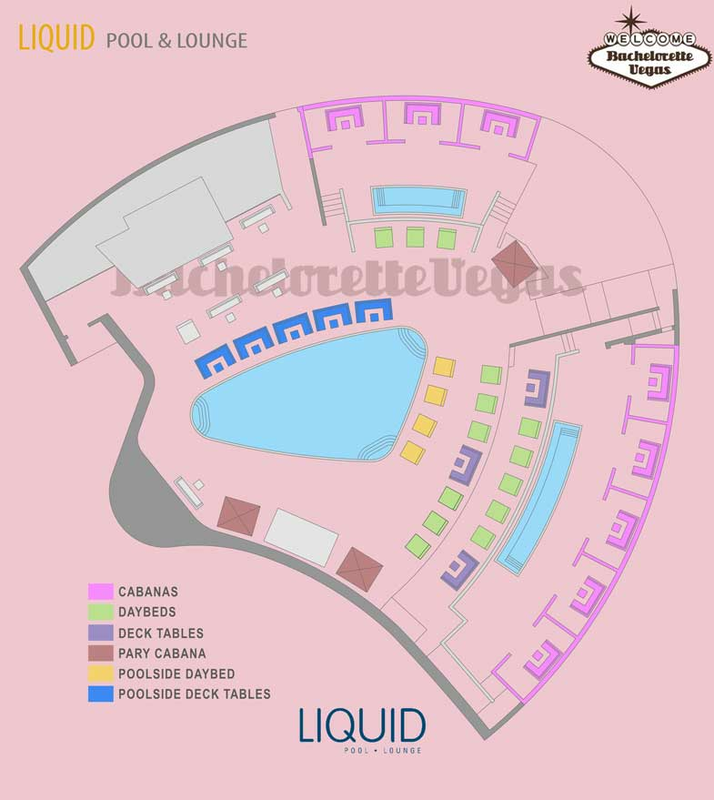 Liquid Pool Lounge has many amazing features that keep guests returning again and again. If you're looking for a place to host your bachelorette party, look no further than the party mecca that is Liquid. As you walk into Liquid, the first thing you will notice is the amazing selection of amenities, despite its small size of 16,000 square-feet. Once you've made your way pass the entrance, a bar complete with a grand selection of mojitos, including dragon berry and pineapple, await. Besides the delicious drink choices, Liquid has an extensive lunch menu with a versatile blend of dishes, such as fish tacos. Enjoy your dining experience by selecting items from a menu created by executive Chef Brian Massle. The 50 seat restaurant also offers pool side dining. Within the 1,200-square-foot pool area, guests can sink into one of Liquid's eight grand private cabanas, complete with a 40-inch flat screen television and mini-refrigerator. If you want to step into the party scene, try and grab a seat on one of the chaise lounges or day beds that line the poolside. The entire pool area at Liquid is Internet-ready and features hand-crafted wicker furniture created by designer Janus Et Cle. If you prefer your bachelorette party to rest for the day inside a comfortable private cabana, consider what amenities you may need. Cabanas at Liquid can hold between 12 and 14 people. These areas feature two 40-inch plasma televisions, a PS3 system, and a wide selection of games such as NBA Live, Madden, and Tiger Wood Golf. Enjoy other perks by renting a cabana or daybed, such as the fabulous gift baskets and robes. No bachelorette party is complete without some dancing with friends. Get a little crazy while listening to a mix from local DJs and some of the industry's best. DJ Loczi can be heard on Saturdays and has performed at some of the top events within the last decade. DJ Scene who mixes for a variety of radio shows throughout California is the resident DJ on Thursdays. Enjoy hip-hop, dance, and top 40 hits at the resort. One of the primary advantages of attending a Liquid pool party is the price. 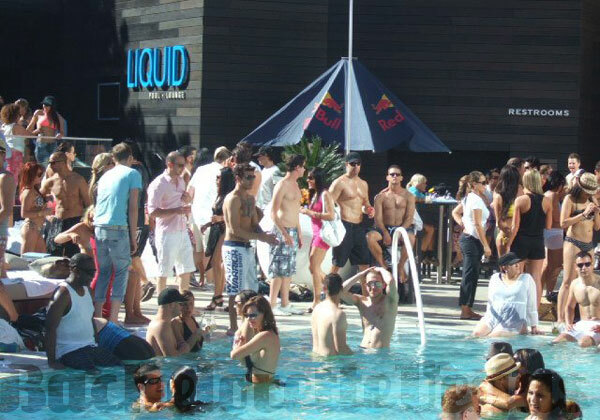 Liquid Pool Lounge is more affordable than many of the other dayclubs on The Strip. Cabanas at Liquid can be rented for as little as $1,500, depending on the day or event. Liquid is open from Thursday to Sunday from 11 AM to 6 PM. Front of the line admission starts at $12 and cabana and daybed packages are available for $350. 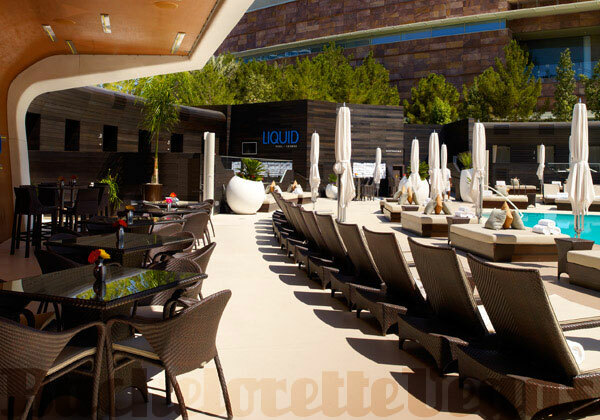 If you're heading to Las Vegas for a memorable bachelorette party, Liquid Pool Lounge is defiantly the way to go.